Choosing the perfect wedding rings is kind of like choosing the perfect dress: fun yet a wee bit overwhelming. Maybe it’s even more overwhelming than dress shopping because while you’ll only wear the dress for one day, you’ll (hopefully) be wearing those bands for the rest of your life. You want something that reflects your personalities both individually and as a couple. With tons of super cute styles in this list, you have plenty to choose from no matter what your tastes are. 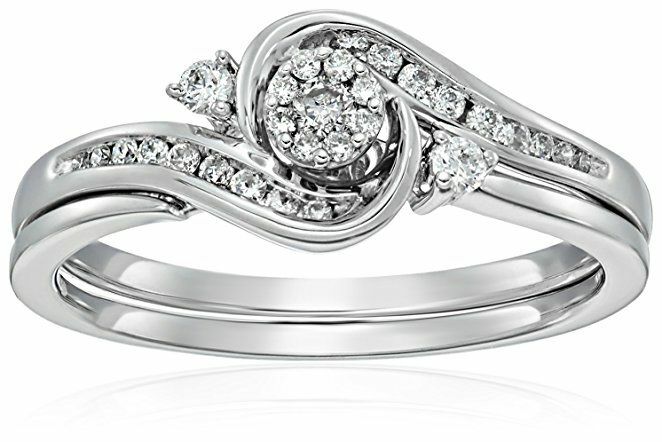 10k White Gold Round Cluster Top Diamond Twist with Interlocking Band Bridal Set: This simple set is a perfect classic look for any lady. The interlocking band keeps your engagement and wedding ring together easily. 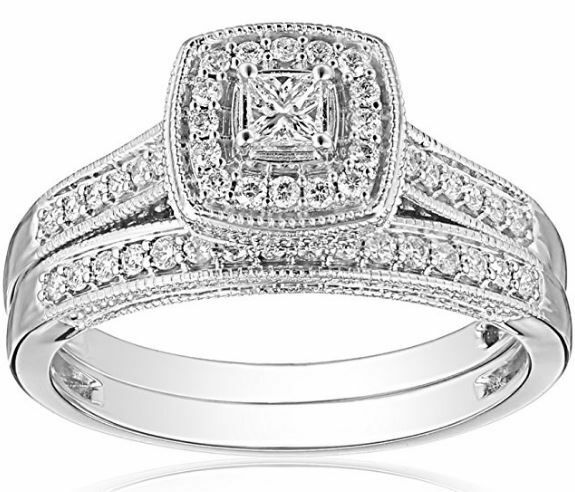 14k White Gold Princess Cut Diamond Bridal Ring Set: This stunning set is the epitome of classic wedding jewelry The beautiful Princess Cut diamond setting looks regal on any hand. 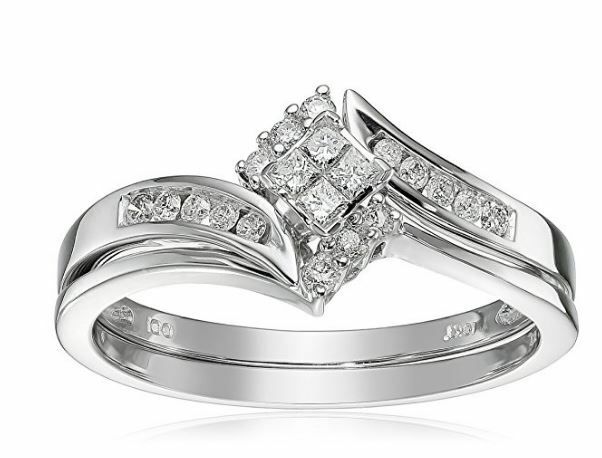 10k White Gold Princess & Round Diamond Bypass with Invisible Set Center Bridal Set: This truly classic piece is a great choice for the couple that wants a beautiful set that doesn’t appear too flashy. Classically cut stones in a simple yet stunning setting are perfect. 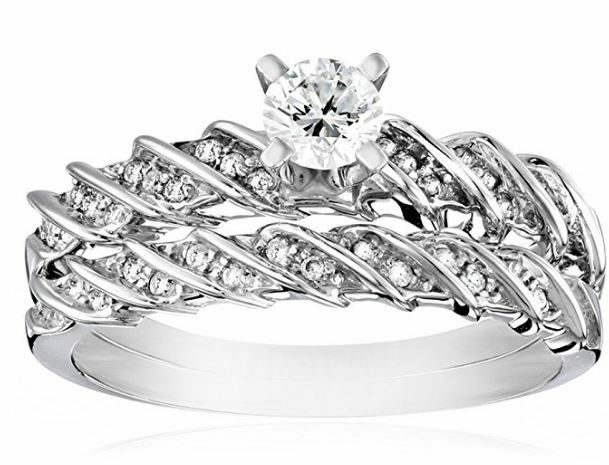 14k White Gold Braided Rope Bridal Set: This simple bridal ring set is unique with the fun braided rope style on both rings. 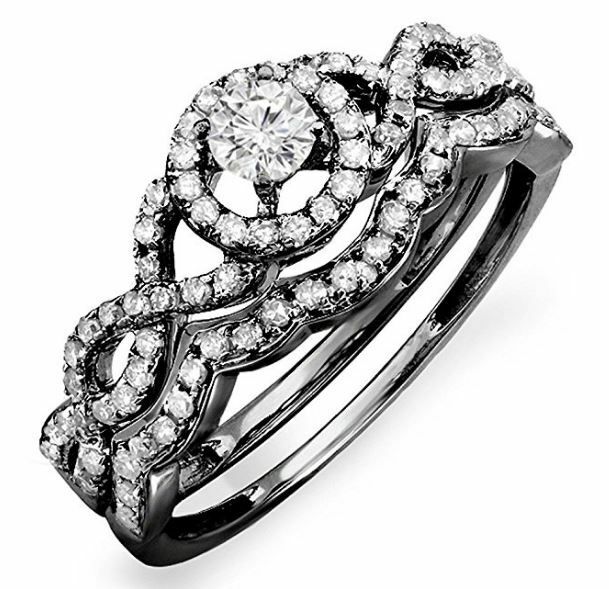 A simple diamond setting is set apart by this unique texture. 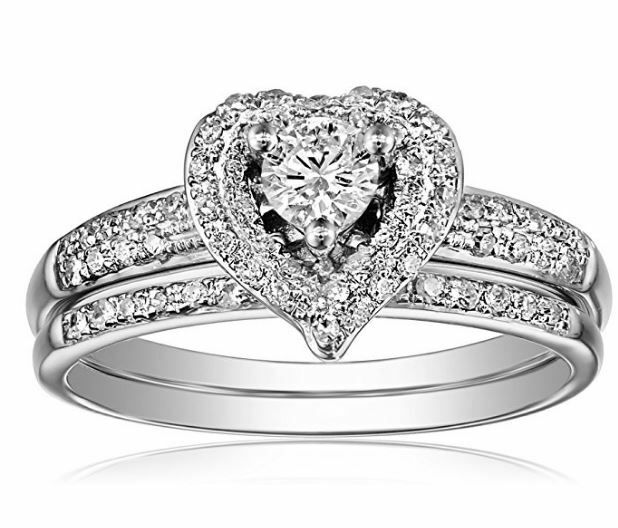 14k White Gold Heart Diamond Bridal Set: This heart shaped setting is perfect for the romantic at heart. A beautifully unique yet simple design that suits anyone. 18k Gold Princess Black & Round White Diamond Ladies Split Shank Halo Bridal Set: This unique bridal set veers away from tradition with the black piece at the center. A gorgeous statement that definitely draws attention this is for the lady who loves being the center of attention. 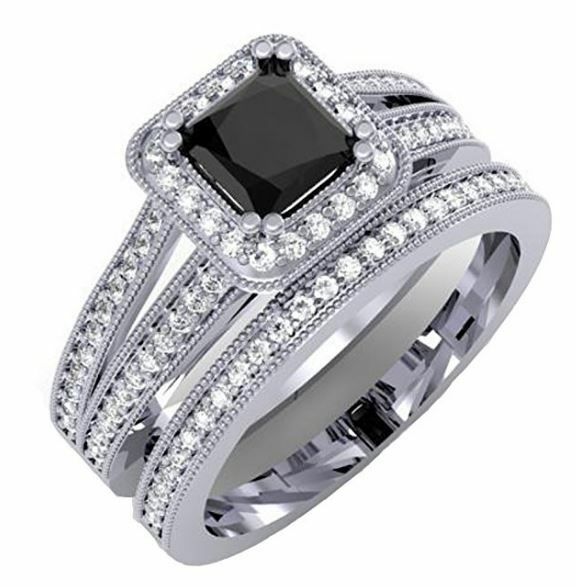 14k White Gold Black Rhodium Plated Round Diamond Halo Bridal Ring Set: This gorgeous set is so unique with the black rhodium plating. It will set apart from any other, and truly show personality while also being a beautiful piece that fits any brides finger. 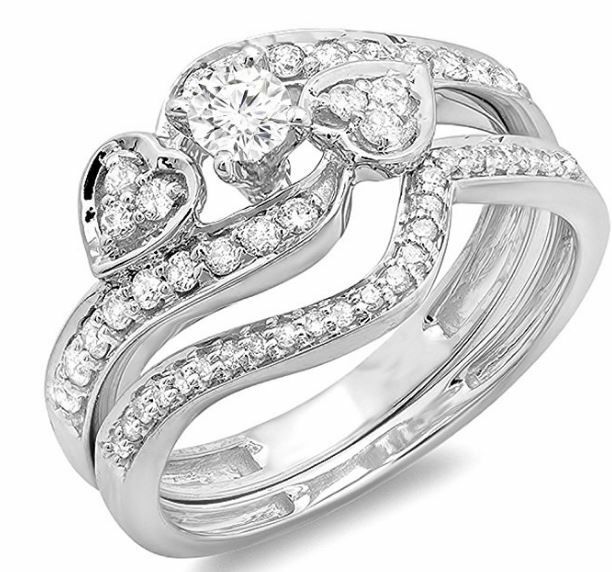 10k White Gold Round Diamond Ladies Bridal Ring Set: This simple set has beautiful heart patterns interlocking the diamonds across the top. It’s a great loving choice for a romantic couple to wear to celebrate their love and commitment. 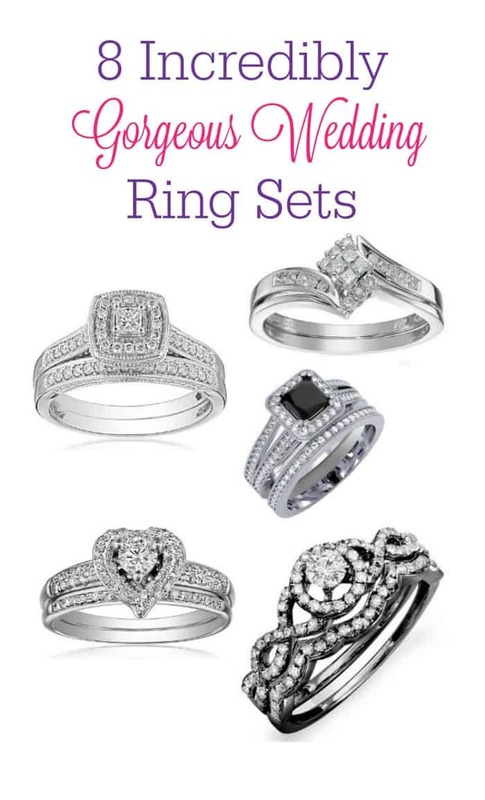 This list of our favorite incredible wedding rings will give you a great place to begin when shopping for that ideal wedding set for your upcoming nuptials.